What's it like to live in Brighton in the Winter? Every seaside town has its peak of activity in the sunnier summer months. In Brighton & Hove, the city comes alive with sunseekers, day-trippers and shoppers, and the streets are heaving with visitors. For Brighton & Hove residents, summer is a very sociable season. After-work drinks on the beach are common throughout the week, daring cycle rides up the steep Ditchling Beacon at the weekend, and plenty of al-fresco drinking and dining. There are also an abundance of outdoor gigs and shows to see; the Brighton Open Air Theatre (B.O.A.T) have regular shows in the amphitheatre in the park and the Big Screen on the beach shows cinematic classics. Around the end of September, like most seaside resorts across the world, Brighton starts to wind down. The seafront bars shut down, streets are a little less crowded and the beach is now a place of calm and tranquillity. Come the evening, the city almost starts to feel like it’s shrinking, and has a homely feel to it as residents can stroll through the North Laine at a leisurely pace to stop and appreciate its architectural eclecticism. A few weeks into autumn, the freshers will ascend into town. Expect bar crawls and busy kebab shops on the nightclub strips – mainly Kings Arches and West Street. Then comes Halloween, when over a thousand zombies take over the seafront in the city’s annual zombie walk. Once the parties are over there is a much more magical feel about the city. Pubs start putting on fully loaded roast dinners again and the comedy clubs kick off a new season. The seafront can be a cold, very windy and maybe even lonely place in the winter; sometimes the waves crash right over the promenade and onto the road. For a fun but wet and windy wave-dodging day out, a walk along the undercliff walk is highly recommended! As the winds calm and the weather starts to chill, preparations for a very Brighton Christmas start, and the structure of the Christmas lights slowly but surely start to appear around the city centre. The lights generally change every year, and stretch across the main shopping areas of North Street, North Laine and The Lanes, topped off by the twinkly blanket of starry blue lights surrounding the Clock Tower that connects roads to the train station, sea front and shops. 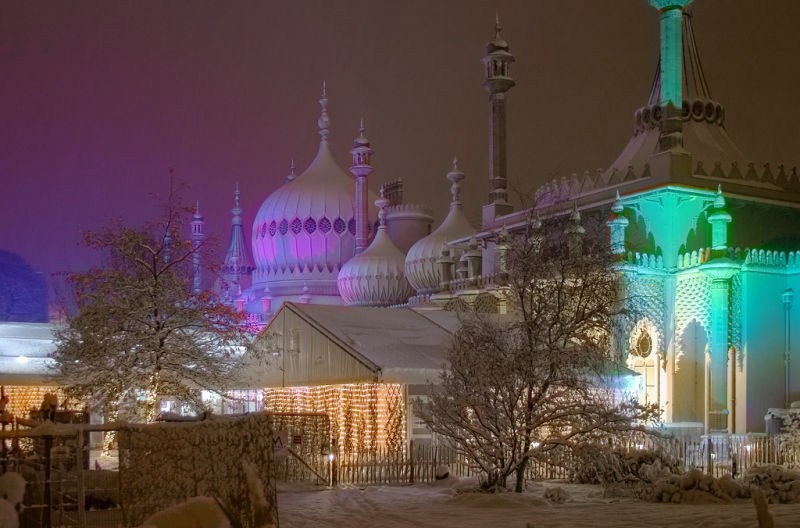 The jewel in the crown of a Brighton Christmas is most certainly the outdoor ice-rink at the Royal Pavilion. The pavilion is a stunning building all year round, but from November it’s home to a palatial winter wonderland. A pop-up restaurant is erected next to the rink; the smell of mulled wine spread throughout and often decorated with fir trees, natural wood and all things alpine almost as though Brighton seafront is being transported to Lapland. On 21st December the Burning of the Clocks parade takes place and is a good marker for the festive season to get into full swing. If you’re looking for a Brighton home to move into for Christmas, have a chat with our Residential Sales team on 01273 688881 or call 01273 688884 for Brighton Lettings.